Scrip is a rebate on the purchases we all make: Food, gas, and other everyday needs. 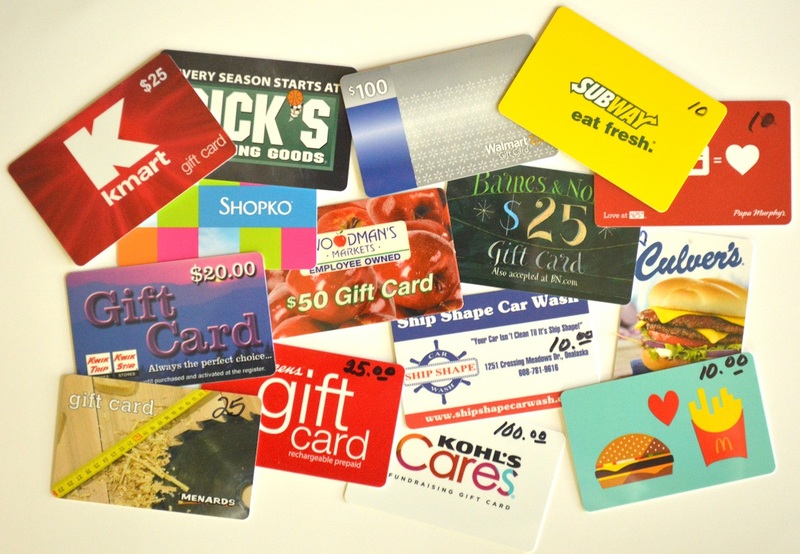 Here is how it works: You buy gift cards at face value and use them in the usual way. MMOC buys those cards from local merchants in volume and at a discount. MMOC pays below face value, and the rest is profit. For example, when you buy a $100 Kwik Trip gift card, you pay $100 and you get $100 worth of gasoline. From your $100, your parish pays $95 to Kwik Trip and $5 is Scrip profit. If you donate that $5 Scrip profit to MMOC, that is just exactly like putting a $5 bill in the collection basket. You didn't have to come up with that $5; in effect, it's a donation made by Kwik Trip because of you! If you know you're going to shop there anyway, so why not take advantage of that $5 rebate? What happens to Scrip profits? Carry Over: You can direct 100% of the profit from your Scrip purchases to apply to your MMOC Religious Education tuition. Each month your Scrip rebate will be applied to your tuition account. Once your current 2016-2017 tuition has been paid through the Scrip Program, you may apply it towards a one-year advance on the 2017-2018 tuition. After this future year has been fully paid, we ask that you donate to MMOC Parish or to our Building Fund. You can purchase Scrip in the Mother's Room before or after weekend Masses. On Fridays, you can stop into the Parish Office and purchase Scrip from 8:30a to 3:00p. You can pay for your Scrip by cash or check. We are unable to process debit or credit cards because bank fees erase the profit margin on Scrip. Now you can special-order Scrip online from any of the hundreds of vendors offered by the Great Lakes Scrip company! Contact Holly Gerling for the enrollment code for MMOC. Create an account using the enrollment code. You pay for the Scrip by setting up a "Presto Pay" account. This takes about three days to process. There is a .15 fee for each online order. Once your Presto Pay account is set up, you contact the parish office with a special activation number. You can then request Scrip from any stores or services available with their company. All requests made by Sunday night will be processed Monday morning and the Scrip cards will be delivered to the parish office later in the week. You will be able to pick up your special order cards at the Scrip table the following weekend or in the parish office. For those of you who do not work online, we can special order cards for you in the parish office, pre-pay only. Myth: Scrip is only for people with kids in Catholic school. Busted: Scrip is for everyone! Scrip earns money for good causes without lifting a finger. There is no easier way to earn money to pay your own tuition bill, help other families, or donate to MMOC. Convenience: Buy Scrip on-the-spot at Mass on weekends or in the parish office on Fridays. Or special-order Scrip online (see below)! When you are under pressure to spend more, a fixed amount of Scrip in your hand might help you stick to your budget. Scrip is a way to turn consumption into doing good, a teachable moment for your kids. If you are not participating in Scrip, why not?